Ensure safety on the road with this compact Emergency Roadside Tool Kit that will fit perfectly in any vehicle. 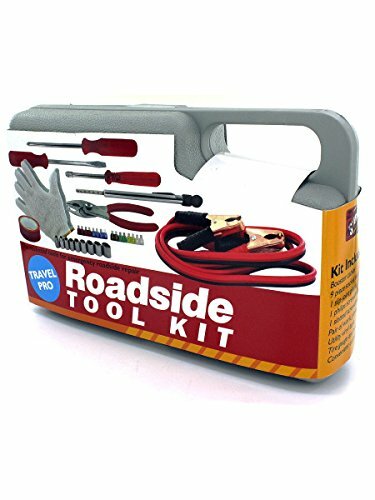 This kit contains the essential tools for emergency roadside repair including a set of 8' booster cables, cotton work gloves, red utility tape, Philips and slotted screwdrivers, a pair of slip-joint pliers, a tire gauge and a 9-piece socket set. Never travel anywhere without your emergency tool kit! This item has its own fold open case for easy use. The case measures approximately 11.5" x 3" x 7". Comes packaged in an individual box. Approximate Package Weight: 29.50 lbs.